We’ve always loved taking days out to go off cycling en famille with our two boys. From the baby days when they would come along for the ride, strapped into their bike seats, progressing to toddler tag-along bikes, and then pedalling along on their own steam, we’ve covered hundreds of miles and have had hours of outdoor fun over the years. But then… our boys grew up and have been loathe to be seen out with mum & dad riding through our locality looking like the Von Trapps. 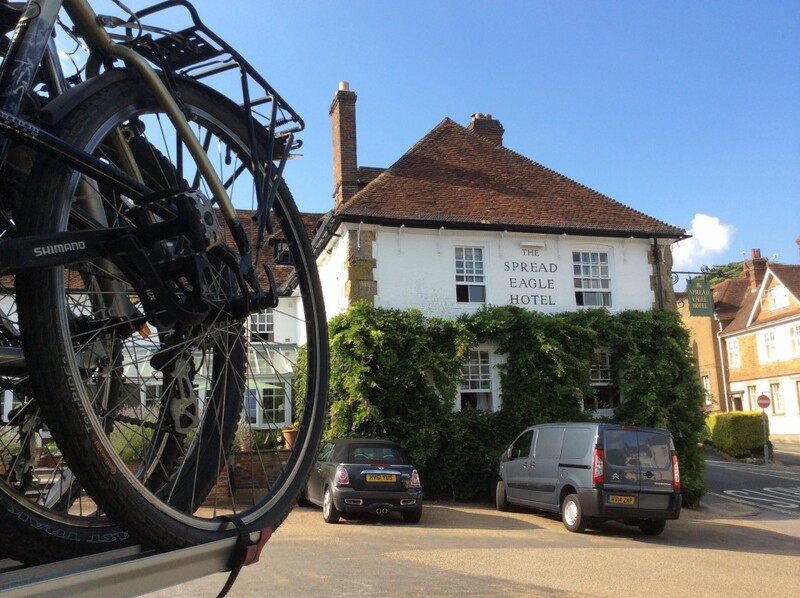 So when I heard about a hotel family cycling package – far from home in the Sussex South Downs – my interest was sparked. What if I took us more than a hundred and fifty miles ‘out of area’ to do some cycling? No one would know them there and we could rediscover the fun we’d had in younger years. With a holiday in a posh hotel with a pool and a trip to the beach thrown in, of course my boys were up for it. Our base was The Spread Eagle Hotel, a gorgeous historic coaching inn, dating as far back as 1430. Set in grounds in the Sussex market town of Midhurst, it oozes old worlde charm, with an excellent spa and every luxury you’d expect from a top hotel. We were lucky enough to stay in ‘The Queen’s Suite’ – Elizabeth I herself was said to have stayed here in 1531 – and unlocking the door to our rooms really was like stepping back into the past. A huge carved wooden four poster bed took pride of place on the sloping (uneven) floor under the sloping (uneven) beamed roof, surrounded by walls retaining their authentic lumps and bumps. The boys had their own adjoining mini bedroom and there was a luxuriously updated ensuite bathroom – complete with shower cubicle specially cut and adapted to accommodate the huge uneven wooden beam straddling the ceiling in there. The South Downs is great cycling country with plenty of on-road and off-road cycle routes criss-crossing their way through the National Park. Staff at the hotel are on hand to suggest routes. We opted for a 20 mile route mainly off-road, taking in the Saltern’s Way through wheat and corn fields, private roads and Chichester Harbour down to the coast to our destination, West Wittering Beach. Staff had advised us to pack our bathers and we were glad we did. After an enjoyable ride on a super-hot day, what better way to cool off than to take a dip in the sea? And after a glorious homeward bound ride (with a sandwich and coffee stop at Chichester Harbour) we all cooled off again with a plunge into the hotel’s pool. Not only are guests treated impeccably at the hotel, but your bikes can be too. Staff will wash them down after your cycle ride and lock them up securely overnight. But the real treat? The hotel’s cycling package also includes a Leg & Foot Energiser Spa Treatment to ease your limbs after your ride. I always thought I was more of a back massage type of girl, but this leggy lovely was one of the most blissful treatments I’ve enjoyed in a spa. I didn’t feel an ounce of guilt as i lay back and let the therapist work her magic on me, figuring my legs had worked hard for this half hour of relaxation. It was the perfect end to an active day. Also included in the package is a gourmet three-course dinner – the menu at the hotel celebrates modern British classic cuisine with dishes such as lamb, calves liver and sea bass – and we enjoyed a delicious and relaxed family meal, dining al fresco on the terrace as the sun went down. For reservations visit www.hshotels.co.uk or call 01730 816911.